Replacing the drive belt on a riding mower requires basic hand tools. Before removing the old belt, pay careful attention to the configuration of the belt, including the way it loops and turns around the system of pulleys that drive the cutting blades. Some riding mowers are equipped with multiple blades that spin in opposing directions. This helps funnel the cut grass through the discharge chute or into a grass-catching bag on the side or rear end of the mower. Install a new drive belt following the same path as the old belt. 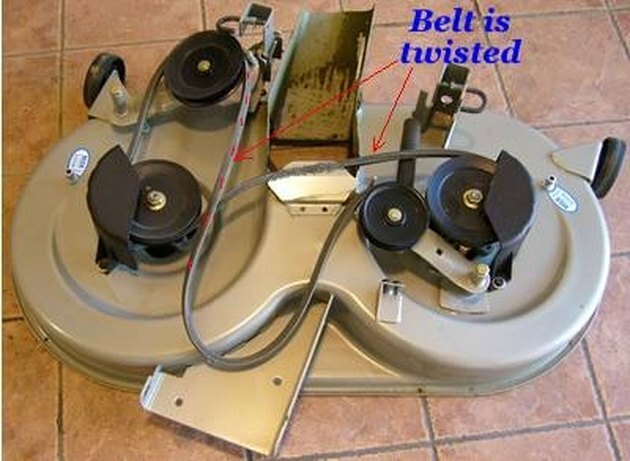 To funnel the cut grass this way, the replacement drive belt must be installed with the same twist in the belt. Make a note of this before cutting off and discarding the old belt. It will save time and headaches. Remove the grass catcher, if your mower is equipped with one. Disengage the clutch and be certain the mower cannot be turned on while you are working on the equipment. Lower the mowing deck to the ground. Release the latches on either side of the deck. Push the deck forward to disengage it from the control rod that raises the deck up and down. The deck should come free of the riding mower. Make a note of the configuration of the old drive belt. Some mowing decks with two or more cutting blades require a twist in the drive belt, which is turned in a figure-8 fashion. Remove the worn belt from the pulleys. Install the new belt around the pulleys in the same configuration as the old belt. Twist the belt if necessary to install around two blade pulleys (the twist causes the blades to rotate in opposite directions). Check the belt to make sure all pulleys are engaged and turning smoothly. Latch and lock the mowing blade back onto the riding mower. Raise the control rod to its maximum height. Slip the free end of the belt around the tension and engine pulleys. Adjust the tension pulley if necessary to maintain a tight fit.